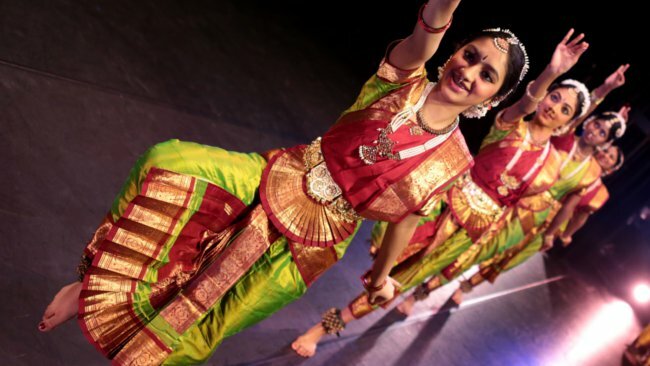 Bharatam’s classes are structured to build a strong foundation, develop sound understanding, and nurture strong dancers well grounded in the classicism of this art. Bharatam does this through a combination of regular classes, and intensive summer workshops at various levels, offered to interested and eligible students of all ages 6 through adult. Classes are held during the academic year late August through early June, at various skill levels in a group format. These classes are conducted in a professional studio setting. Through the year, students are trained on technique, dance discipline, and also the cultural backdrop that contexts this art. Students are introduced to complex items and traditional repertoire as they progress through different levels. The intent is that students learn the art in all its richness that demands both body dynamics and narrative skills. New beginner groups are usually added in fall. Students, after a few years of training, are offered summer workshops, with focus on intensive learning over a period of 1-2 week duration. They are also exposed to other master practitioners and professional artistes through these intensive learning environments. Dancers at higher skill levels get opportunity to audition for Bharatam productions. Bharatam’s hallmark is the strong foundation it builds in each dancer through personal attention, and a discerning eye for quality.